I am quite excited to try this at our colony this year as so far I have heard a GHO (Great Horned Owl) hooting in a wooded lot across the street. It makes my blood run cold since I know that once an owl discovers the plump morsels that reside within the large white “orbs” in my yard, my colony is as good as gone. NOTHING is more destructive to a colony that owl predation…maybe snakes…hawks are up there also. But owls are up there for sure. “I have had problems with Great Horned Owls every year since my colony started, because my colony is pretty remote…I set (The Dancing Man) up with a timer that turned on at 10pm and off at 6am. That was the end of my GHO problems. I looked outside constantly and never saw a sign of a Great Horned Owl. I was losing 2-3 martins every night until I started using the dancing man.” R. A., Pa.
We have also heard rave reviews from some great folks on Facebook like Paul Whodatnation Gremillion. We are working on making a version of this dancing man available on our website, but if you look around and you can get it cheaper, GO FOR IT!!! We plan on getting one ASAP! Just Google SKY DANCERS or AIRDANCERS. 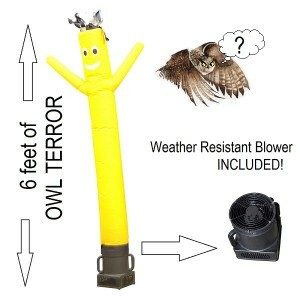 Try and get one with a weather resistant blower as some are not. Also some are sold WITHOUT the blower and that is not always clearly stated (on sites such as Amazon) so beware. Let us know your experiences! 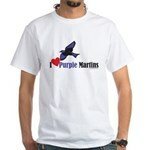 This entry was posted on Friday, January 22nd, 2016 at 7:38 am	and is filed under birding, predators, product review, Purple martins, purplemartinplace, www.purplemartins-r-us.com. You can follow any responses to this entry through the RSS 2.0 feed. Both comments and pings are currently closed.